Please note that the content of this book primarily consists of articles available from Wikipedia or other free sources online. 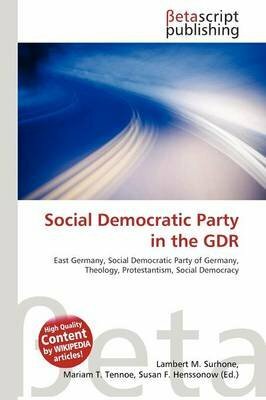 High Quality Content by WIKIPEDIA articles Early in 1989, the Protestant theologians Markus Meckel and Martin Gutzeit, took the iniative to refound a Social Democrat party in the GDR. The two made organisational preparations and in April 1989 produced the first draft of the foundation appeal. In August, the appeal was presented at the Golgathagemeinde parish in Berlin. The appeal was signed by Meckel, Gutzeit, the director and human rights advocate Ibrahim B hme and the theologian Arndt Noack. Calling for the foundation of a political party outside of the system of the National Front (East Germany) was a direct challenge to the political system of the GDR and especially to the ruling Socialist Unity Party of Germany (SED), whose basis was undermined by the mere existence of a Social Democratic Party.